How do your Eyes Work? How do your Eyes Work? You are here: Home / Frontpage Article / How Do Your Eyes Work? The iris, the coloured part of the eye, regulates the size of the pupil, the opening that controls the amount of light that enters the eye. 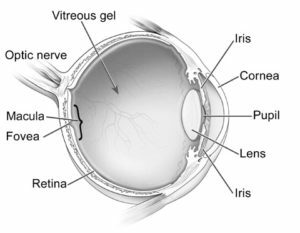 The retina is a thin, delicate, photosensitive tissue that contains the special “photo-receptor” cells that convert light into electrical signals. These electrical signals are processed further, and then travel from the retina of the eye to the brain through the optic nerve, a bundle of about one million nerve fibres.